Some of us are lucky to come from close knit families and they are important parts of our lives. Brothers and sisters the world over have a special bond, sometimes they like each other, sometimes they hate each other, sometimes they don’t understand each other, and sometimes they’re on the exact same page. If you are fortunate enough (or, at times, unfortunate enough) to have a sibling, you know they never cease to amaze whether it be for the good or for the bad. 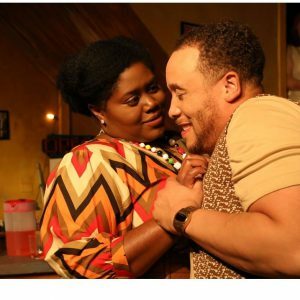 The Strand Theatre’s latest offering, Detroit ‘67 by Dominique Morisseau, Directed by Erin Riley gives us a glimpse into the lives of an African-American brother-sister relationship amidst the strife and change of late 60s Detroit. Part of a trilogy including Skelton Crew and Blue Paradise, Morisseau manages to capture the authenticity of these people and their times in both dialogue and storyline. With the addition of all the great music of the time from The Temptations to Mary Wells to Marvin Gay, this piece promotes a certain nostalgia that makes for a charming evening of theatre. Detroit ‘67, as the title states, concerns itself with happenings in Detroit, Michigan during the year 1967. Chelle and Lank, sister and brother, try to earn some extra money by opening up their basement as an after-hours joint and everything is running smoothly, if not under the legal radar. One evening, a hurt, broken woman with a mysterious past finds herself into Lank and Chelle’s home and lives and soon the brother and sister are arguing over more than after-hours “business.” Just as their bottled up feelings explode, so does Detroit and they find themselves stuck right in the middle of the Detroit riots of 1967. Brian Douglas’ Set Design and David Cunningham’s Scenic Art is superb, to say the least. Walking into the theatre, one is transported to a basement of an average home in Detroit and the attention to detail is amazing. From the staircase leading to “upstairs” to the concrete façade on the back wall, including two highly placed windows, places the audience into the action and adds great value to the production. Douglas uses his intimate space wisely and Cunningham, with the help of the script, gives us little touches here and there such as an old painting of a 6 year old adds authenticity to the entire setting. Kudos to Douglas and Cunningham on jobs quite well done. Lighting Design by Lana Riggins and Sound Design by Carlos Guillen are also stellar adding realism to the piece, as a whole. A good light and sound design are not very noticeable and do not take away from the action, but, instead, blend into the action and this is exactly what Riggins and Guillen have accomplished. The script calls for a hefty sound design as is, with music and songs from the era, but the added effects that are chosen fit in flawlessly and with the lights and sound working in tandem moving the story along, it makes for a well put-together design. When it comes to an overall look of a piece, this era, the 60s, is one of my favorites to experience. With so much fashion and cutting edge designs (for the time), costuming for this period can be daunting but Costume Design by Lori Travis hits the nail on the head. Each character seems to have stepped right out of a late 60s closet but all look totally natural in their threads. Finding period costuming for gentlemen isn’t necessarily easy, but it’s a little easier to find pants and shirts for guys than it is to find particular period styles for the ladies. However, Travis has done it in this piece, especially for the character of Bunny, who seems to be on top of the fashions of the day, and every outfit she appears in is on point. All of the costume choices made for this production are spot on and realistic adding a great deal of value to the entire production. 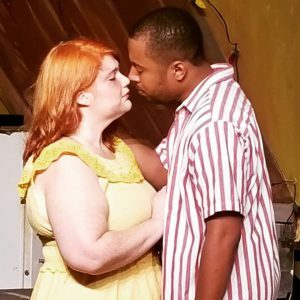 Erin Riley takes the helm of this production of Detroit ‘67 as Director and it’s clear she has a great comprehension of this piece and understands the material quite well. Her staging is terrific and her casting couldn’t have been better for this particular production. She has a good grasp on the message of family and compromise in this piece and presents it beautifully on this stage. Through her guidance and Morisseau’s script, it makes for a delightful, emotional evening of theatre with peaks and valleys that are required for a great show. Moving on to the performance aspect of this piece, we being with Rachel D. Reckling as Bunny and Mack Leamon as Sly. Both of these actors know their characters and portray them genuinely with little flaw. Reckling is comfortable as Bunny, the fast-talking, quit witted go-to girl of the neighborhood. Though her lack of eye contact can be distracting at times, disconnecting her with her fellow cast mates, her performance, overall, is commendable. She gives just the right amount of attitude, sass, and compassion as required, making her a very likeable character. Leamon, too, is confidant and comfortable in his role as the laid back, helpful best friend and he completely embodies this character. He has a strong presence and gives a great showing making him a character to whom the audience wants to be pals and can relate. Caroline, the mysterious outsider who has, by a strange fateful meeting, finds herself engrossed in the lives of Chelle and Lank, is played ably by Betse Lyons. Lyons does quite well in this role and seems to have a good grasp of what her character is going through. She portrays the beaten and broken Caroline beautifully, if not a little too timid. The character is afraid for herself and for her new friends but many times, it was hard to follow along with Lyons as she stuttered and mumbled her way through a lot of her lines. However, that’s not to say her performance was bad because it most certainly was not. She’s comfortable on stage and her presence is strong making for an admirable performance, overall. A certain highlight of this production is Troy Jennings who tackles the role of Lank, a young man just trying to make his way in life who is tired of making ends meet through different odd jobs and wants something stable for himself and his family and friends. Jennings takes this part and makes it his own. He emotes the conflict in Lank and his ideas of what is right and wrong. His chemistry with his cast mates is natural and he moves and speaks with purpose delivering the dialogue as if he were simply holding a conversation, adding legitimacy to his performance, especially in his scenes with Shamire Casselle. Speaking of Shamire Casselle, she is a standout in this piece as Chelle, the worrying, older sister who likes things the way they are and is resistant to change, but understands it’s inevitable. Casselle is superb in her portrayal of this character. Her ability to show the emotions of her character from happy to upset to angry is spot on. Right away, she is able to connect with her audience making her and endearing character. She gives a solid, robust, and charming performance that makes her one to watch. I’m looking forward to seeing more of Casselle’s work in the future. Final thought… Detroit ‘67 is a nostalgic and poignant look at a bygone era when the music was great and people helped each other, when in need. Dominique Morisseau has crafted a beautiful piece incorporating humor, tenderness, high emotion, and humanity that crosses time and space. The story takes place in the late 60s and concerns itself with subjects of family, racial tensions, and blurred lines between the races, but it is still quite relevant today. The production is one of the best I’ve seen this season (so far) from the set, to the staging, to the performances, this is not a show you want to miss this season. Get your tickets now, while they last! This is what I thought of The Strand Theatre’s production of Detroit ‘67… What did you think? Please feel free to leave a comment! 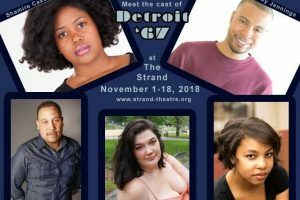 Detroit ‘67 will play through November 18 at The Strand Theatre, 5426 Harford Road, Baltimore, MD. For tickets, call the box office at 443-874-4917 or you can purchase them online.